NeverSeconds: An Indian story again by Harshi. An Indian story again by Harshi. 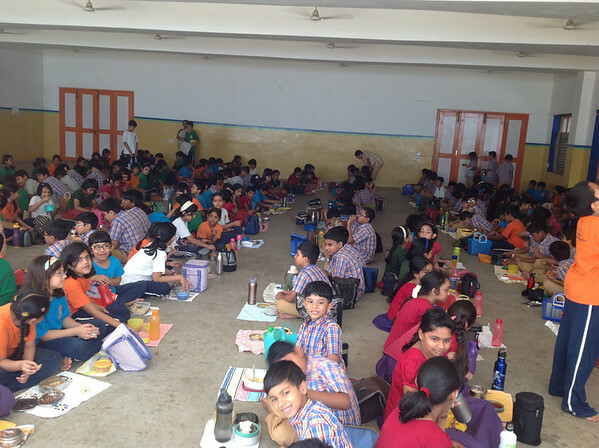 In India there is a saying,"Every morsel of food you waste today represents hunger later in your life"--Although it seems a bit harsh, elders quote this to children who waste their food and the children gradually learn to respect food and to never waste it. We all know that food shortage is a huge problem in the world. 1/3 of the food produced across the globe is wasted from which millions of starving people can be fed. This wastage is due to poorly managed supply chains and includes household wastage too. As children what can we do? We can do great help from our side, like taking only the food we can eat, this ensures that no food is wasted. When we think of wasting our food because we don't like it, we should take a moment to think about the starving kids who are badly in need of food. We should grow strong in order to help others. So eat healthy food without wasting it and remember to be thankful for the food you get! I think Martha is doing a great job, helping starving kids around the globe and raising awareness about them. 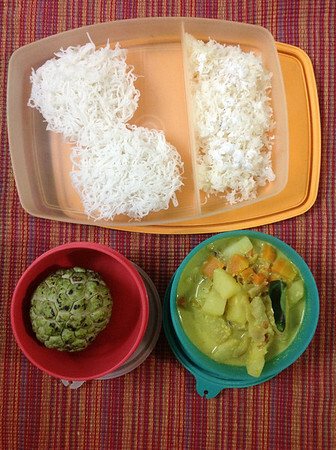 Today's lunch is Idiyappam- A typical South Indian rice noodle dish. It is different from its Chinese counterpart. It is prepared freshly from fresh rice dough and is cooked in steam. Noodles in the small compartment is sweet, it was mixed with sugar, ghee, and grated coconut. The noodle cakes in the other one are plain . I had them with the vegetable stew. The vegetable stew had carrots, potatoes, and turnips. All the veggies are cooked with coconut milk and lot of spices whose names I don't know. Spicy stew with plain Idiyappam is very yummy! The fruit for the day was the Custard apple. It doesn't taste like apple nor does it taste like custard! It has a cluster of black seeds covered by a thin white layer of fruit. Though I like the taste of the fruit I find it difficult to eat the fruit. What a wise young person you are, Harshi. I am impressed by your thoughtfulness and practical concern for other people around the world. You put to shame many adults who waste food (and many other things! ), as well as children here in the West who are so fussy that they refuse to try food they don't know, but sometimes take far more than they need, then waste a lot. Well done - your meals have been very interesting and look really tasty. Wow, before this all I knew about Indian cuisine are curry, tandoori, naan, samosa. Good to see you also have noodles. When I first saw the custard apple I didn't know what it was so I decided to look for it in the internet and found out that I eat it rather often! It just looked so different in the picture hehe We call it 'cherimoya/chirimoya' and it means 'cold seeds'. Is this food that Harshi brought from home, or was it provided by the school? Thanks. It is a home packed one. 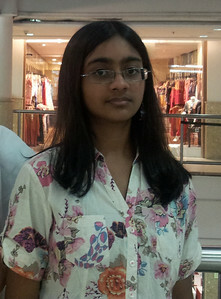 Harshi, you are such an articulate and aware young lady and pretty too. As someone said a post or two ago, it is so interesting to see non-banquet Indan food. I would happily eat any of your lunches. What do you eat for brrakfast? do you have an after school snack? what is a typical evening meal? do you ever go out for non-Indian food? do you have a favorite? thank you for taking the time to write such interesting posts. Thank you. Actually we eat rice or roti for breakfast. My first post is typical indian lunch. Our school started very early in the morning. So we packed breakfast also. All my rice items are eaten as b.fast also. Your food looks very interseting, I think I would also be annoyed with the fruit! I was wondering why so many boys have the same shirts on? Both Girls and boys are wearing the same colour dress. It is our school uniform. In India we have to wear uniform dresses to school. Students comes from many kinds of financial and cultural background. In order to avoid the status difference between students schools has a strict dress code. So that all are treated equally. I like my school uniform. We have custard apple in Brazil. In Portuguese is "pinha"! Thank you for the support from india. As you said today I post multi grain food . That looks more like a meal, than a UK school meal. I like custard apples, probably because I dont have them very often. Well done, great post,great food. Idiyappam very delicious with coconut milk.. Just remembering my ma's preparation..